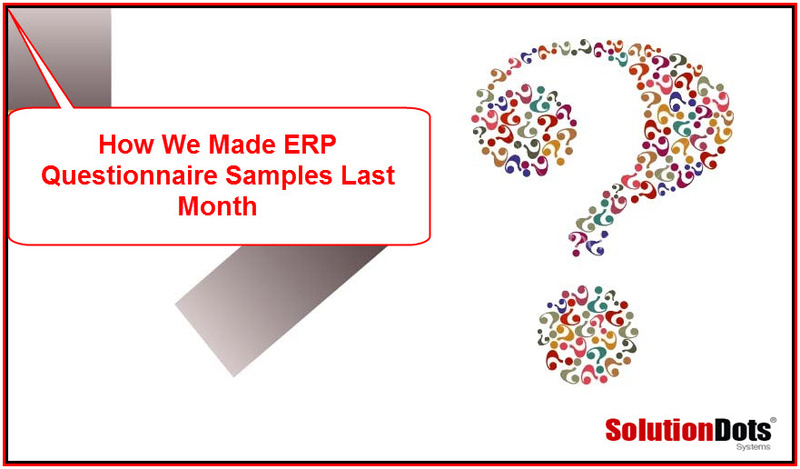 To understand and fulfil customers satisfaction SolutionDots conduct ERP questionnaire samples. ERP questionnaire samples, feedback from customers let us know that where we can still work or need of upgrading thing’s. ERP questionnaire samples show the commitment of work and loyalty of our management team with clients. ERP questionnaire samples is MCQS type. This ERP questionnaire samples contain total 25 MCQS related to your ERP (Enterprise Resource Planning). ERP questionnaire samples MCQS will take hardly 25 minutes from your precious time. To start fill some personal information about yourself and your organization so we can help you in future. Kindly select one option and where “multiple select” is written you can choose more than one options to answer ERP questionnaire samples questions. ERP questionnaire samples Question No.1: Which ERP is your company using? What is the name? ERP questionnaire samples Question No.3: Your industry or business sector belong to? ERP questionnaire samples Question No.4: Any ERP systems is implemented or in the phase of implementation in your organization? ERP questionnaire samples Question No.5: Which department of the organization initiated the idea of adopting an ERP system? ERP questionnaire samples Question No.6: Did your organization use outside consultant to assist with ERP implementation? ERP questionnaire samples Question No.7: Did you find it necessary to re-engineer the business processes? ERP questionnaire samples Question No.8: What is/was the motivation for ERP implementation in your organization? ERP questionnaire samples Question No.11: How much the ERP system fulfil your company's business strategy? ERP questionnaire samples Question No.12: What technical problems, if any, were encountered during or after the ERP implementation? ERP questionnaire samples Question No.13: How long was the implementation of the ERP system? ERP questionnaire samples Question No.14: What type(s) of training after ERP implementation in your organization is provided? ERP questionnaire samples Question No.15: How frequently do you experience problems with your application interfaces? Centralization and Security in terms of usage by authorized personnel only. ERP questionnaire samples Question No.17: Do you think the working culture has changed completely after implementation of ERP in your organization? ERP questionnaire samples Question No.18: What do you think about the workload in the organization after implementation of ERP in your organization? ERP questionnaire samples Question No.19: Does due to Business Process Restructuring goals and task are clearly defined for increasing productivity? ERP questionnaire samples Question No.20: Does the management keeps track of the activities in the organization due to ERP implementation? ERP questionnaire samples Question No.21: Does the problems are resolved in an efficient manner with the help of ERP Solution of the company? ERP questionnaire samplesQuestion No.22: Are you satisfied with information sharing within the organization due to ERP Solution Implemented in the organization? ERP questionnaire samples Question No.23: Rate your satisfaction with ERP and Business Process Restructuring in the organization? ERP questionnaire samples Question No.24: Did you complete ERP implementation in the organization was within your original budget? ERP questionnaire samples Question No.25: The ERP project was worth the money you spend on it?